Some of the comments to the previous articles specifically asked about routing. We want to know that the GPS is not routing us thru low clearance bridges or on other roads that are inappropriate for RVs. This video shows how to plan a route thru Baltimore. Other trip-planning devices would take you thru a tunnel, but the TripMaker knows that there’s a problem there. Watch the video to see how it works. 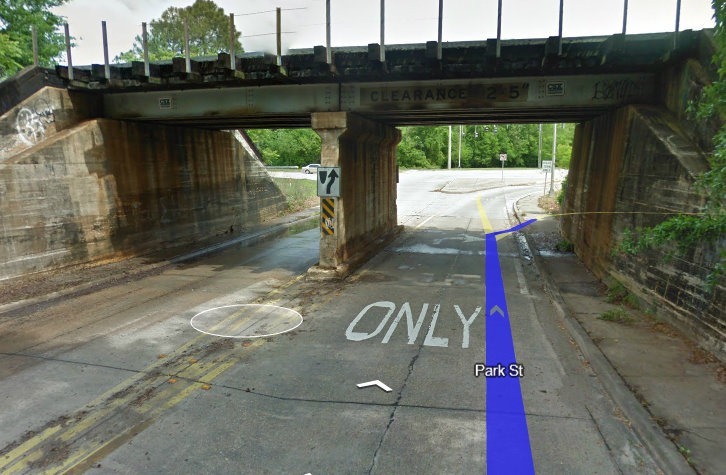 Using Google’s Street View – you can see the low clearance! Now that’s exactly what we want right? The Rand McNally TripMaker simply plans a route that avoids the low clearance. 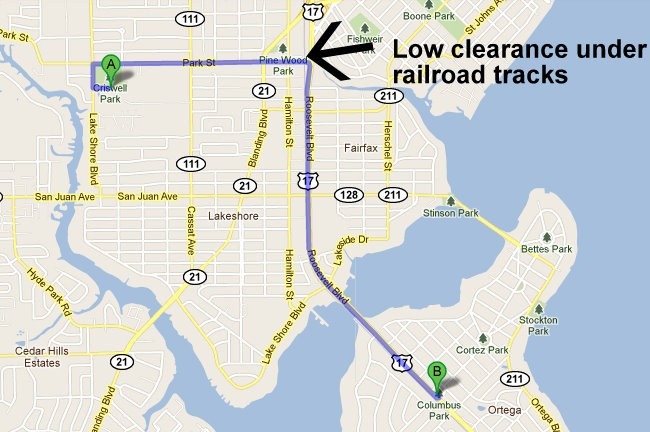 Note: There are low clearance bridges on Mill Creek Rd. between State Route 45 and Forman Rd. and between Jefferson St and the preserve on Mill Creek. 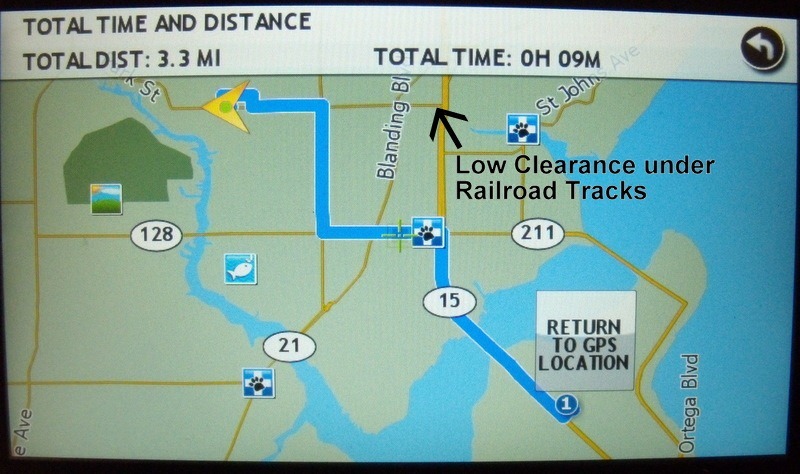 Yet, when you use the Rand McNally TripMaker GPS, it will route you right thru that low clearance bridge. If you mark it as ‘Avoid Permanent’ – then the GPS will never route you on that stretch of road again. If you don’t care about marking it permanently, it is easy to use the ‘Detour’ feature to plan a different route right now. Pros: If you are an RVer and you want to have lots of information available to you as you are traveling, you will love the Rand McNally TripMaker RVND 7710 GPS for RVs. As I wrote in the first article, my favorite feature is the ability to look at the amenities at the next Exit. You also get alerts for State Borders, Time Zones, and certain Points of Interests. You can very quickly find Walmarts and Truck Stops and Route to them. Cons: Although the screen is relatively large (7 inches) the resolution is a lot lower than I’m accustomed to on my tiny Droid cell phone. I find I can view maps more clearly on my Droid. And, if you’re accustomed to the touch screen of a smart phone, you will find the GPS touch screen to be clunky and slow to respond in comparison. The TripMaker is slow to calculate routes. To be fair, we have the ‘Beta’ version of the device. They sent it to us to evaluate before it was available to buy – the retail version may be faster. Also, it is faster when you’re planning a route starting from where you are. I was often testing routes elsewhere. The RV routing capabilities is both a Pro and a Con. It’s a Pro because it does take your RV’s height, weight, and propane into account as it calculates the route. It’s a Con because it’s not perfect – it doesn’t know about every low bridge, for example. This is not the panacea that many RVers hoped for. It’s hard to believe that, only 10 years ago, these devices didn’t even exist! How quickly we’ve started taking them for granted and being upset when they’re not perfect! I do like the TripMaker and we will use it for RV Navigation. But, it won’t be the only thing we use. I will still consult the map on my Droid smart phone when I am questioning our route. We will still plan the trips using Streets and Trips. I haven’t yet tried to transfer a route from S&T to the TripMaker – I’ll let you know when I do. And, oh yea … you’ll always see a paper map on our dashboard! Geeks on Tour is a membership website with hundreds of Tutorial Videos on topics of interest to travelers, such as managing digital photos with Picasa, Route-Planning with Streets and Trips, and sharing your travels with a website using Blogger. You can subscribe to our free enewsletter, or become a paid member and be able to view all of the videos in the Learning Library. Published by MrsGeek, in Maps/GPS, Show-Me Video. Tagged with Geeks on Tour, GPS Navigaton, Maps, Rand McNally 7710, RV Route Planning, Tutorial Video. I read your review of the RVND 7710 with interest and would like to purchase a unit for my rig. I was wondering if you were going to do a review and comparison to the Magellan RoadMate Pro 9165T as I am not sure which one would be the best for my use. I have used the Mcnally GPS recently. I followed it,s directions and soon found myself driving class A coach through narrow streets with over hanging trees. It put me on a major street that it passed up when I exited the freeway earlier. I can only hope this corrects itself. I intend to experiment with it in my car to see it it works differently with different vehicle lengths. I my case I listed over all length as 50feet. Even more reason not to be on small residential area with large coach. Let’s face it, no GPS is going to be right all the time. It frustrates me when the GPS database is incomplete or just wrong. At least the Rand McNally has a feature to report inaccuracies. I don’t know how long it will take to implement those updates, though.